The premise of writer/director Nancy Meyer’s frothy follow-up to IT’S COMPLICATED is very simple: Robert De Niro plays a retired widower who becomes an intern for an online retail startup run by a much younger boss played by Anne Hathaway. In an opening voice-over set-up, De Niro’s 70-year old Ben Whittaker lays out how his retirement has had him struggling to fill time despite taking classes, learning to cook, reading, going to movies, and resisting the advances of Linda Lavin as a fellow aging Brooklynite. Ben happens upon a flyer for a “senior intern” program at a fashion e-commerce company called About The Fit, so he puts on his best suit, dusts off his 1973 attaché briefcase, and applies. Ben’s video resumé, which he had to call his 9-year old grandson to get help with, is a big hit and he’s hired, but the company’s extremely ambitious yet very wet behind her ears founder Jules Ostin (Hathaway) isn’t fond of the idea of having him around. To further irk her, and to get the plot going, a snappy Andrew Rannells (Girls) as the company’s office manager assigns Ben to work directly with Jules, but at first she doesn’t give him anything to do. This changes as over time Ben brings a can do spirit to every task he’s given, and Jules comes to rely on him just like we’d expect to happen. Also like we’d expect, Ben befriends and doles out wisdom to his co-workers played by Adam Devine *, Zack Pearlman, and Jason Orley, and he strikes up a romance with the office masseuse (Rene Russo, who co-starred with De Niro in SHOWTIME back in ‘02). Conveniently, Ben catches Jules’ chauffeur boozing, so he takes over as her driver for a bit, which allows him and us to meet her stay-at-home husband (Anders Holm*), and her five-year old daughter (JoJo Kushner) at their posh Brownstone (of course it’s posh – every interior in a Meyers movie is posh). In another all too convenient moment, Ben happens to see Jules’ husband with another woman, which serves as our third act conflict. I guess Meyers figured that Jules’s struggling with whether or not to bring in an older, more experienced CEO to head her company wasn’t enough of a plot point. Earlier this week, De Niro walked out of an interview with a reporter from the Radio Times because of what he called her “negative inference.” The reporter, Emma Brockes, had apparently pissed him off with a question about how he resists going into “autopilot mode on set.” The question maybe was a little rude, but many critics and fans, myself included, have accused him of walking through a lot of his later day roles, “phoning it in” so to speak. But here, De Niro fleshes out Ben nicely and makes him one of his more convincing normal guy roles. He appears to put as much effort into the part as his character puts into his daily duties. Hathaway also brings plenty of pluck to her performance, and makes for a perfect Meyers protagonist – a tough, but vulnerable witty woman who is great at her work. 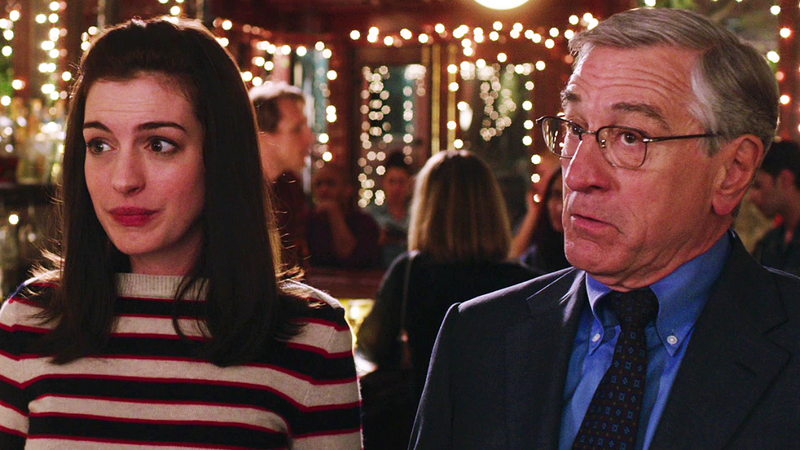 Her scenes with De Niro have a palpable tenderness to them, even when they veer towards cheesy sentiment at times. Speaking of cheesy, the movie overplays its cute kid card with Kushner as Jules’ daughter, and a subplot about De Niro, Devine, Pearlman, and Orley breaking into Jules’ parents’ house in order to delete an offensive email that she mistakenly sent is too wacky for the film’s own good. Meyers’ screenplay and direction is sharper than on her previous films, even if the sitcom-ish sensibility still remains. The movie doesn’t really have much to say about workplace relations, but it has an undeniably progressive air about it nonetheless. Underneath the layer of obvious generation gap gags that is. Filled with the same can do spirit of its leads, THE INTERN is a warm, fluffy film that’s as polished as it is predictable. Sure, it’s lightweight, but its likability factor is through the roof. It made me smile more than it made me laugh, but that’s fine – I’ll take it. *It’s fitting that this workplace comedy would have two cast members from the Comedy Central series Workaholics.